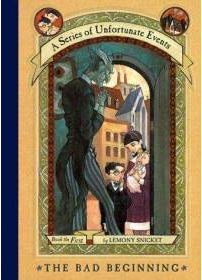 We know Lemony Snicket peppers his books, from a bad beginning to the very end, with references to classic books. "I speak from experience. I once knew a lady who in temper and mind greatly resembled your sister, who thought and judged like her, but who from an enforced change -- from a series of unfortunate circumstances" ---- Here he stopt suddenly; appeared to think that he had said too much, and by his countenance gave rise to conjectures which might not otherwise have entered Elinor's head. The lady would probably have passed without suspicion, had he not convinced Miss Dashwood that what concerned her ought not to escape his lips. As it was, it required but a slight effort of fancy to connect his emotion with the tender recollection of past regard. Elinor attempted no more. But Marianne, in her place, would not have done so little. The whole story would have been speedily formed under her active imagination; and every thing established in the most melancholy order of disastrous love. You can find it in volume 1, chapter 11. But the story of his lost love, Eliza, awaits you later in the novel (volume II, chapter 9).